The Expert Logger 300 is Delphin‘s new generation of data loggers. It combines the latest communication technology with advanced measurement technology, and is based on FPGA technology to make it especially powerful. It can process up to 46 analog input channels at both low and high rates of sampling. Measurement data can be accurately acquired, independently stored and transmitted to the internet or a PC for evaluation via USB, LAN, WLAN or LTE. Sensors are connected via plug-in screw terminals and a chart clearly shows how channels are arranged. Users always have a good overview of the channels despite their high density. Each set of four terminals can be configured as two differential inputs to measure voltage, currents, thermocouples, or to take measurements from a 4-wire RTD. 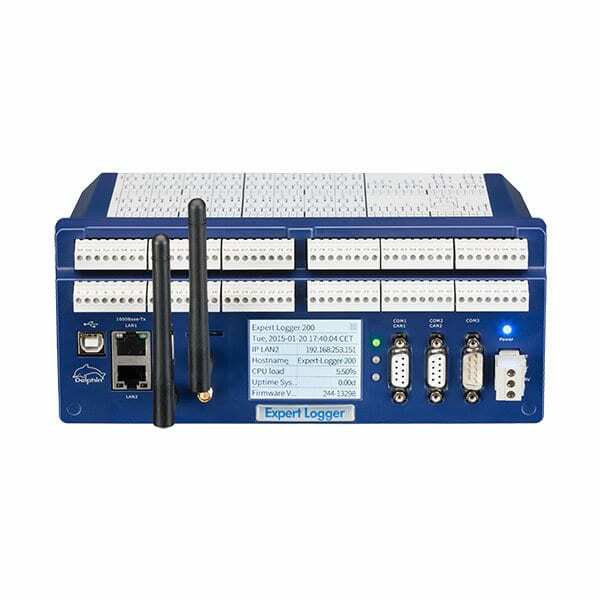 The Expert Logger 300 is simple to configure from a PC. These settings remain stored within the Expert Logger even when disconnected from the power supply. 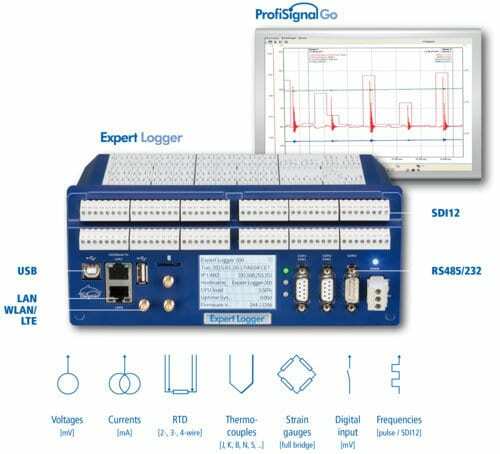 The device settings can also be read out and stored on a PC and analysed offline without the need for a connected Expert Logger. The offline configuration settings are then simply read into the device when connected. The software used for configuration is simple to operate to let users fully focus on their measurement tasks. Signal processing using internal software channels significantly simplifies measurement tasks. Flexible calculation channels enable measurement data to undergo further computation and recording. Integrators directly calculate volumes or quantities from time related measurement data such as mass and discharge flow rates. Limit values can monitor measurement data and be used to switch digital outputs or automatically send emails. Complex signal processing is possible using pulse counters, stop-clock functions and operating-hours counter. Averages can be calculated and recorded as time-weighted or moving. The Expert Logger‘s software channels clearly set it apart from other loggers and make it very popular among users. Installation is very simple. It takes just a few mouse clicks to go from sensor connection to trend output. There are virtually no limits to trend portrayal for online and offline measurement data. Archived and online measurement data can be evaluated without having to interrupt ongoing measuring procedures. This is a unique function that is especially valued by customers. In addition to y (t) diagrams are y (x) – and logic diagrams. The ProfiSignal Go Toolbox contains trend functions such as movable axes, zoom functions, cursors, markers and data export (e.g. as CSV or EMF files). Using the toolbox is self-explanatory. Configured trends can be saved and reused. For visualization and automation functions, software upgrades to ProfiSignal Basic and ProfiSignal Klicks are possible at any time. ProfiSignal Go also provides alarm management. A global alarm list provides a clear portrayal alarm notifications in tabular form. Alarm settings for the monitoring of over-runs, under-runs, process violations, status outcomes etc. are configured using the DataService/Configurator software. Measurement data can also be used to trigger specific actions, e.g. sending text messages or emails or switching digital outputs. Delphin products are equipped with drivers and interfaces to enable the import/export of data to external hardware and software. Laboratory equipment (e. g. scales, analysis/output devices) can be connected via USB and RS232/RS485 interfaces. A variety of protocols are available.